I’m gradually improving on the health front: it seems my respiratory system is in good shape and I didn’t need to have a thoracic catheter jammed into my ribcage last weekend, after all. I’m definitely recovering, however slowly. On my doctor’s orders I spent the weekend breathing deeply and trying to hack up all the crap in my chest… the effort of which does seem to have helped a great deal. Funnily enough, the one thing that has been really helping me get through the whole pneumonia ordeal has been a nightly glass of brandy. I consider it folk medicine, really, although apparently there is some scientific data to back up my anecdotal evidence. Mind you, I doubt my doctors would agree: as I progress ever-further into middle age I’ve come to the conclusion that just about everything I enjoy in life is contraindicated by my physician. But a glass of brandy in front of the fire seems to help with the chest congestion and sore throat. And of course, it works wonders for my morale level. I enjoy drinking. Not to excess, of course: I’m not twenty-one anymore (and to be honest I didn’t enjoy getting completely hammered all that much even then) so bouncing back from a drunk just doesn’t happen as fast as once it did, but I’ve discovered a genuine pleasure in nursing a glass or two (or, I’ll admit, sometimes three on nights when I don’t have to work in the morning) of something strong while curled up in the den, my loyal dogs snoozing on the couch beside me and a good book on my tablet. 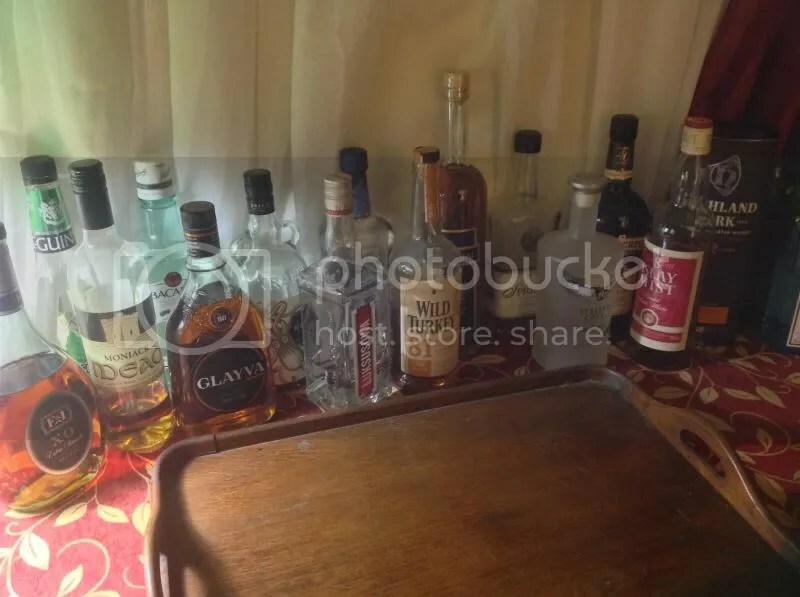 A couple of months ago, after the garage got renovated into The Wife™’s new office/project/storage room, I took advantage of the additional space in the downstairs living room; laying claim to one corner and an antique sideboard during the furniture shuffle, I declared my intention to put together a bar. We already had a cupboard which hosted our (by which I mean my) stash of liquor and wine, but I wanted something a little more convenient. And on display. So I filled the sideboard’s cupboards with new glassware (including proper brandy snifters and highball glasses, something I’ve always wanted) and splurged a bit on putting together some staple bar stock and equipment, bought a wine rack to accommodate the fruits of a very generous gift certificate we were given for helping at our friends’ wedding… and the end result is I now have a modest home bar, conveniently located near a comfy reading chair and the fireplace, and just in time for winter, too. I was actually a little apprehensive about broaching the project with The Wife™, and it’s taken me a little while to understand why: I’ve spent a lot my my adult life worrying about my drinking. Not that I drink too much, but I have the habit of second-guessing myself about substance abuse because I’ve seen too many people get in over their heads. During my parents’ divorce my dad turned to drinking as a way of coping, which was pretty rough on all of us — especially him. In college and university I knew people who just got completely freight-yarded every weekend… and heavy drinking is endemic in the activist subculture (partly as a result of the average age of student activists and partly as a method of coping with stress and trauma.) I know people in the re-enactment and re-creation subcultures who are fantastic folks until the start binge-drinking around the campfire. And probably most traumatic of all, I lived with a guy who got into drugs in big way and who cleaned out my account and left me holding the bag for months of unpaid rent and utilities; I ended up living in my mother’s basement for half a year, which is no fun at all when you’re twenty-seven. I invest a lot of time into second-guessing my own substance consumption, is the point I’m trying to make… and like all people who are insecure about some part of themselves, I assumed that everyone else was watching and judging me on it, too. In fact, it wasn’t until I broached the subject with The Wife™ that I realized I was, perhaps, over-analyzing the fact that I consume alcohol. I was very timid when I put forward the suggestion that a home bar might be nice, I assumed she disapproved of my “heavy drinking” and would be angry that I wanted to be out in the open with it. She wasn’t. And in fact I got the impression she didn’t know what the hell I was worried about. “Can you stop at one drink?” she asked. In an alcoholic’s house, the only bottles with dust on them are the forgotten empties. I’ve got a good job, a stable home and a loving partner. There are a lot of pleasures related to those things, a lot of perks and privileges. Compared to the maelstrom of my twenties, my thirties are turning out downright staid; having eschewed the adrenalin-highs of my old rubber-bullet dodging days, I suppose I need to find my pleasures where I can. And interestingly, I’ve found that the real pleasure in having a home bar isn’t in drinking the drinks, it’s in savoring the anticipation. I enjoy being able to ponder what I’m going to try tonight, and if it often turns out to be the same thing I usually have, well, whatever. But if I want to try something different, or new, or look up on the internet how to make a Tom Collins, then I can. No fuss, no bother, and I’m pretty sure I’m going to enjoy the results. And I think it’s time to stop beating myself up over my completely normal enjoyment of the little things.